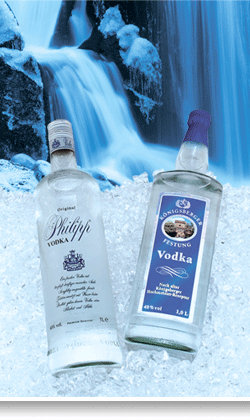 CONDOR is your specialist for the development and production as well as distribution and export of spirits. We provide you with our own as well as foreign brands and from a certain number of units we also offer the bottling of your own brand with your own label. To date CONDOR has developed more than 100 different spirits – from vodka to rum, whisky and brandy to special cream liquors. Besides our own spirits CONDOR also bottles your brands or takes over the development, bottling, and the shipment of these individual gifts for industrial customers. With our wide range of products we supply duty-free-shops/travel value in various countries and stock shops with affordable and at the same time high-quality spirits. Besides the classical trade chains, also wholesalers in the duty free-area (like Heligoland, Russia, Ukraine, Belarus or subsidiaries at the Black Sea) are among our customers. We also export our products to Turkey, Greece, Baltic countries and Great Britain, as well as to third countries e. g. Korea. New in our portfolio is the partial supply to German residents of German embassies (diplomat delivery) as well the German marines worldwide. For almost 20 years CONDOR has stood for competence in the production and distribution of spirits in- and outside Germany – all from a single source.